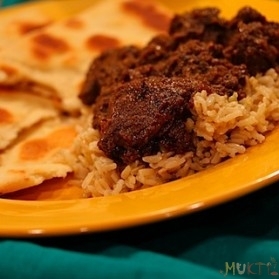 Learn to make Butter Chicken and Paratha with Mukti. Come join us! SEE NEW CLASS DESCRIPTION BELOW. 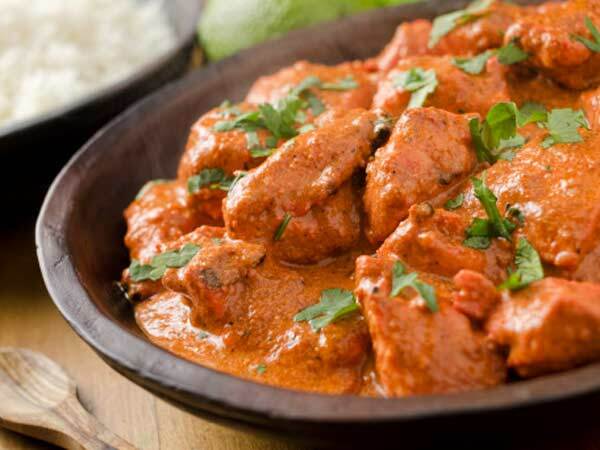 Butter chicken and paratha dinner may sound like a heavy meal, however don’t let the name fool you. This dinner is actually a relatively light, refreshing meal. Ironically, butter chicken doesn’t have butter in it. Instead, it uses ghee. In my kitchen, I try to avoid heavy cream or such ingredients, unless it is an absolutely must, and preferred by my students. The chicken here in my kitchen is marinated in spices, herbs, lime juice, and yogurt. The yogurt and lime juice give the dish a more refreshing taste, and it balance the flavors between the ghee and spices. The name of the dish may sound simple but a lot of ingredients are used for this dish giving it a rich flavor but light taste. It is mouth-watering. Aloo paratha is a bread dish, these flat breads might not seem special but inside they are stuffed with spice mixture of mashed potatoes. Making good aloo paratha requires a lot of practice; the mashed potatoes are formed into a ball and then wrapped around with bread dough. Then it is carefully rolled out into a circle; the aloo paratha has a chewy and soft texture to it. 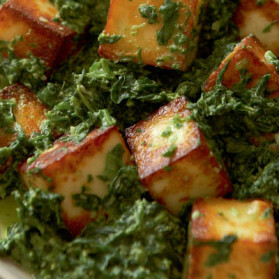 Saag paneer is a simple dish that goes well with aloo paratha. This dish is simply spinach with cheese; we will make the cheese in my kitchen because fresh cheese is always the best. 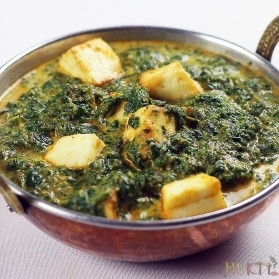 The cheese is mixed with the spinach giving it a creamy yet light taste to it. 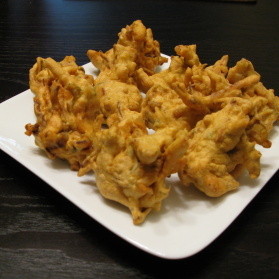 Lastly we have pakora, which is onion fritters, a type of appetizer that is crunchy on the outside and chewy on the inside. Onion itself may not be appetizing to eat, however these onions are mixed with masala, which is a mixture of spices and the flavors from these spices will make you love onions. We cook all of the above, and then we sit down in a relaxed setting, and enjoy the foods we just made by ourselves.